Take a cue from south of the border for a grilled main-dish salad. 1. Place the chicken into a large bowl or resealable food bag, with 2 tablespoons of the chipotle paste and the vegetable oil. Mix to combine and leave to marinade for 20 minutes. 2. Preheat a griddle pan or BBQ to medium-high heat. Remove the chicken from the marinade (discard the marinade) and cook for 10 to 12 minutes, turning halfway, until cooked. Leave to rest for 5 minutes then slice to serve. 3. Meanwhile, mix together the salsa, coriander, remaining chipotle paste, oil, lime zest and juice in a small bowl. Add the corn, pepper and black beans to the mixture and combine. 4. 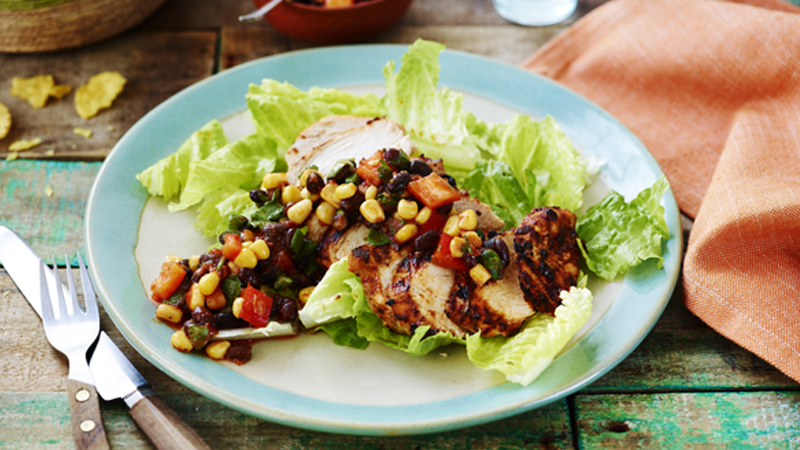 Divide the lettuce between the plates and top with some of the chicken and bean and pepper salsa. Serve the rest in a bowl alongside. Serve with Old El Paso™ Original Nachips™ or tortillas. Griddle extra vegetables whilst cooking the chicken breasts - sliced courgettes, peppers, onions and aubergine all taste great when cooked on the griddle or BBQ.